143 pages | 46 B/W Illus. Many books explain how to construct a value stream map, but few explain the process conditions and characteristics required to ensure a value stream map can be completed successfully. Lean Execution: The Basic Implementation Guide for Maximizing Process Performance fills this need. Although the book explains Lean methods and tools that maximize process performance, its main focus is on providing readers with detailed guidelines, process conditions, and helpful tips for ensuring successful implementation. Based on Clifford Fiore’s insights and experiences gained through years of firsthand application and implementation of Lean methods, the book supplies easy-to-understand explanations of proven Lean tools, methods, and concepts. For example, the concept of flow/theory of constraints is reviewed using a garden hose analogy. The text introduces material in a manner that mirrors the natural sequence for general implementation. It provides simple calculations, worksheets, and examples to reinforce the key concepts involved with determining production rates and process variation. In addition to explaining how to apply Lean tools correctly, the book provides the big picture perspective required to select and apply the appropriate Lean tool at the right time, while gaining helpful insight about the process under review. Sharing valuable lessons learned by trial and error, the book can help practitioners save valuable time and resources by not repeating similar mistakes. The book concludes with a summary that outlines a blueprint for maximizing success during implementation. Clifford Fiore has spent more than 30 years at a Fortune 500 company and is a recognized leader in applying Lean and Six Sigma methodologies. He is also a certified black belt and Lean expert. Through his work in adapting process improvement techniques in engineering, manufacturing, and the supply chain, he has emerged as an industry leader in implementing concepts towards reducing product cost, quality defects, and development cycle times. 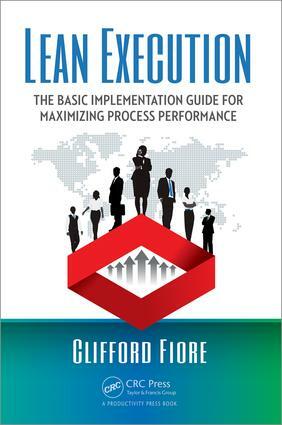 "Lean Execution: The Basic Implementation Guide for Maximizing Process Performance provides a thorough, easily understandable, step-by-step ‘how-to guide’ with respect to implementing Lean activities in your organization that can be utilized as a training guide or as a concise refresher." Cliff Fiore has been employed by a Fortune 500 company for the past 30 years and is a certified Lean expert and Six Sigma black belt. He holds a Bachelor of Science degree in Mechanical Engineering Technology and a Master of Business Administration degree in Technology Management. Early career stops included positions in manufacturing engineering, design engineering, and production support. For the past 18 years, Cliff has been involved with continuous improvement activities associated with the application of Lean and Six Sigma. He has extensive experience in applying these concepts in numerous manufacturing, supply chain, and administrative processes, particularly in the area of product development. Cliff has authored two previous books on the application of Lean methods in product development: Lean Strategies for Product Development, published by ASQ in 2003, and Accelerated Product Development, published by Productivity Press in 2004. Cliff has been an adjunct faculty member in the Maricopa County Community College District for the past 15 years teaching courses in Lean manufacturing, blueprint reading, technical writing, and properties of materials.